A group of Sixth Formers went to the Mini Plant on Thursday. 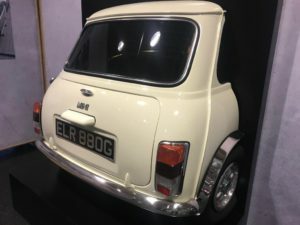 The tour started in the Mini Museum housing the various Minis different times with some interesting designs – such as a cow hide exterior – shown. Our tour was led by a veteran of the plant who has worked there for 55 years, starting off as a floor worker in the assembly shop before moving on to teaching/guiding internships for the younger employees. The first part we went to visit was the assembly shop which housed 1,200 robots and around 8-10 mechanics (in each shift) per cell. This was a drastic change from the 1970s which had around 2,000 people doing the work. The robots would work in cells doing different jobs in different areas before passing it to the next process. In the assembly shop they would make the frame and joints of the car and put it all together. Once all this is done it is then sent off to the paint shop. The tour moved into the production line where the rest of the car gets finished. The cars are moved along conveyor belts to help production and movement flowing where each station did a specific job. We saw great examples of ‘Just in Time’ manufacturing with Poka-yoke seen! It was interesting to learn that there are up to 15,000,000,000,000,000 available combinations in a Mini. 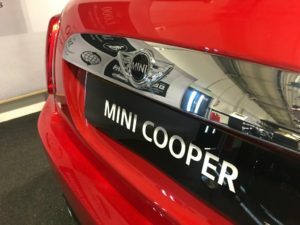 Each car made has already been sold and the production line was set up to make sure that their unique car specification was made. Once the car is completed, it is tested before being distributed to their consumers around the world via their onsite train terminal or lorry. We found the trip interesting and it was beneficial to be able to see many of the manufacturing techniques and strategies we have been studying used in real life. We would like to thank Miss Holland, Mr Giles and Mr Rush for taking us.